A baggage handlers' strike is set to hit passengers flying into and out of Madrid this weekend, budget airline easyJet is warning. The airline is urging travellers flying out of Madrid to cut the amount of luggage they check in with those arriving in the Spanish capital warned to expect delays of up to two hours in receiving their bags. 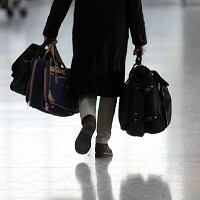 The airline admitted there could be some "minor disruption" to flights and an increased risk of bags failing to connect to flights, highlighting the importance of passengers having travel insurance. The airline is advising passengers travelling between now and Sunday to repack into two small bags that can be taken on board as hand luggage and stowed in overhead compartments to minimise the amount that has to be put into the holds of aircraft. Commenting on the delays likely to be faced by those flying into Madrid, easyJet said: "We appreciate that this is an unacceptable delay and is very inconvenient." The carrier said it would continue monitoring the situation and working with the handling agent to try and avoid excessive delays.